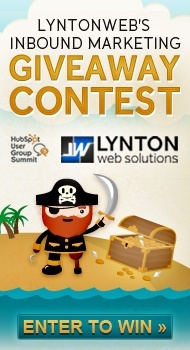 If you've kept up with the latest LyntonWeb news at all the last couple of months, you can probably tell how excited we are to be sponsoring and attending HUGS 2011 this week! Not only are we announcing the winners of our fabulous inbound marketing giveaway contest, and not only are we excited about seeing some of our inbound marketing heroes, but we at LyntonWeb will also be on hand to moderate a roundtable discussion you won't want to miss. So, whether you're new to inbound marketing or are a seasoned HubSpot veteran, we'd love to have you stop by and contribute to an all-too-important discussion for online marketers and business owners alike. And a final, friendly reminder .. it's not to late to sign up to win our HUGS Giveaway Contest! Check out the details of our prize packages, and register for any and all that interest you. (Don't worry, you don't have to be present at HUGS 2011 to win.) Good luck, and we hope to see you in Boston! Register to attend HUGS 2011, September 15-16.